This article is about the Titan Master CEO. For the Revolutionaries villain we thought was named "Garrison", see Merklynn. The reverse Iron Man: A robot superhero who disguises himself as a human billionaire. 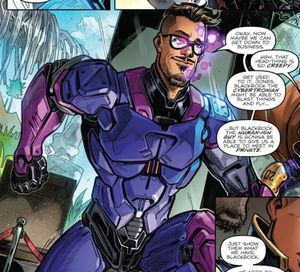 Originally a Cybertronian Titan Master known as Sovereign who was made to believe he was human, Garrison Blackrock was the eccentric founder and CEO of consumer electronics company (and secret weapons manufacturer) Onyx. Once his true identity came to light, Blackrock became a wanted man by humanity and Cybertronian alike and was forced to go on the run until he teamed up with Mayday, Action Man, and Kup as a member of the Revolutionaries. In his search for the Enigma of Combination, Onyx Prime sent Sovereign to Earth to retrieve the lost artifact and act as a sleeper agent, brainwashing the Titan Master such that he believed he was human. Retaining no memories of his past beyond vague recollections of being visited by a "black angel" as a child, Sovereign came to believe he was a descendant of Gilgamesh known as Garrison Blackrock and would eventually go on to found Onyx; a consumer electronics company that reverse engineered Blackrock's considerable collection of Cybertronian technology (including the Enigma) to create products that made people's lives easier. Secretly, however, Onyx also used that same technology to build weapons such as the EDC's Seeker clones and the mechs used by the People's Liberation Army Mecha Force. The IDW incarnation of Blackrock is the product of two independently-conceived character concepts being merged together: G.B. Blackrock the human originally from the Marvel Generation 1 comic and Sovereign the Cybertronian created for the Titans Return toyline. This page was last edited on 17 January 2018, at 02:02.